Image: Project Boundary Rider was developed to assess the use of spatial technologies in protecting the wine grape industry from pest and disease threats. Image supplied by Vinehealth Australia. Could the smartphone be used in the fight against on-farm biosecurity risks? A recent trial led by Vinehealth Australia has shown encouraging results. Protecting South Australia’s winegrape industry is serious business when you consider that the industry contributes an estimated $2.11 billion to the State’s economy each year. Vinehealth Australia – the body charged with leading the fight against phylloxera and other pest and disease threats in South Australia – has recently completed a project aimed at assessing the fit of a pocket-based solution to help growers tackle biosecurity issues at the farm-gate level. 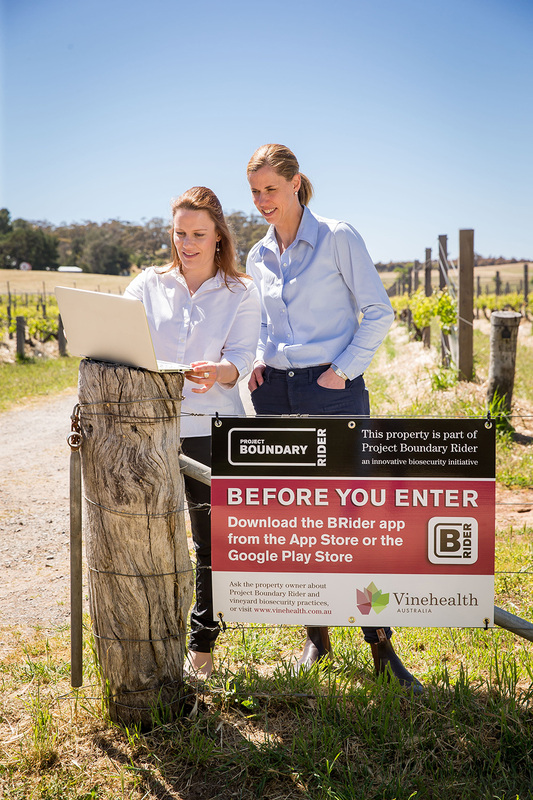 Coined Project Boundary Rider, the demonstration pilot was rolled out among selected vineyards in 2017 as a way to see what role spatial technologies might play in on-farm biosecurity. The system uses geofencing technology to define a virtual boundary around a grower’s holdings, with triggers set up to send a notification each time a smartphone crosses the property boundary. Once the geofences are established, the landholder and any visitors use the Boundary Rider app to track movement across the property, providing notifications and alerts to users. The log of movements across the property is stored in a cloud-based server and is available for the grower and Vinehealth Australia to review. In the case of pest or disease outbreaks, this information can be accessed to potentially help pinpoint the source and minimise any spread. In 2017, a trial of the technology was launched among vineyard owners in the Barossa and McLaren Vale regions on a total of 130 separately fenced sections. Once the geofences were established, vineyard workers and contractors downloaded the Boundary Rider app that automatically monitors movements across the boundary. ‘[During the trial, we] recorded more than 4,194 sets of movements across the geofences in the pilot. These movements have been consolidated into electronic visitor logbooks for each vineyard owner, with records showing who has gone in and out and when,’ said Suzanne McLoughlin, Technical Manager for Vinehealth Australia. Vinehealth Australia CEO Inca Pearce says the pilot showed ‘huge scope’ for the tool to be used in the fight against biosecurity risks. ‘The trial proved that the system definitely has the capability to act as a biosecurity measure,’ she said. Since releasing information about the trial, several other agricultural sectors have expressed interest in the technology. ‘Representatives from the pork, dairy and grains industries are interested in how the technology could be adapted to suit their biosecurity needs,’ Inca said. Vinehealth Australia was commended for Project Boundary Rider with a Small Project Award at the South Australian Spatial Excellence Awards in 2017.